©Bert Gildart: In the Sonoran desert, characterized in part by Organ Pipe Cactus National Monument, everything seems to revolve around water, and generally, from the scarcity of it. For the past few days as we’ve been hiking and biking the area, that fact has been driven home. 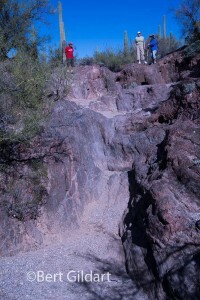 Several days ago, we hiked to Red Tanks Tinaja, a formation that is configured to collect water, something it apparently does well, for the damp sands were stippled with the tracks of ungulates, perhaps peccaries or the endangered Sonoran antelope. 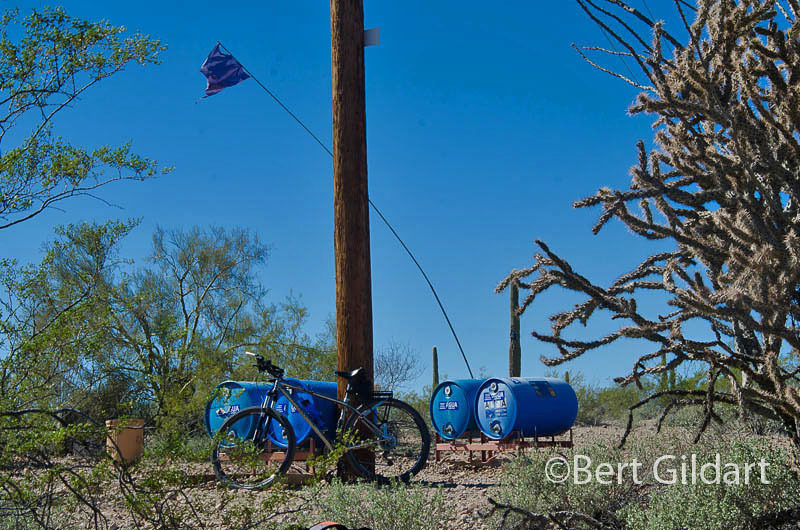 Lastly, it has been impossible to forget my chance sighting last year of four compassionate water tanks located while biking one of the park’s more remote areas. As I’ve learned from reading the absolutely incredible book entitled The Devil’s Highway, many undocumented immigrants have perished while trying to steal through this park – hoping to find a better life in the States. The tanks are still there, but this year it appeared as though they were seldom used. Nevertheless, in combination with the more natural features just described, they are all reminders that heat is a killer, resolved in part by the presence of water. Lesson? 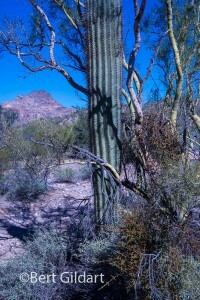 Carry lots when you explore, particularly now as the Sonoran winter gives way to an unexpectedly warm spring. Today, on this February the 13th, here at noon, it is according to our Airstream thermometer 97ºF – outside. This entry was posted on Saturday, February 13th, 2016 at 6:38 pm and is filed under National Lands, Natural History/Conservation, Outdoors. You can follow any responses to this entry through the RSS 2.0 feed. You can leave a response, or trackback from your own site.